This kit contains 336 pFusX clones allowing for Golden Gate assembly of 15-16 RVD TALEN inserts in one cloning step rather than two. This kit consists of four 96-well plates, and will be shipped as bacterial glycerol stocks on dry ice. Samples should be frozen at -80°C immediately upon arrival. Individual plasmids can be ordered at $65 per plasmid, and will be shipped as bacterial stabs. This kit is incomplete without several accessory plasmids. Please read the description below for details. FusX: A Rapid One-Step Transcription Activator-Like Effector Assembly System for Genome Science. Ma AC, McNulty MS, Poshusta TL, Campbell JM, Martínez-Gálvez G, Argue DP, Lee HB, Urban MD, Bullard CE, Blackburn PR, Man TK, Clark KJ, Ekker SC. Hum Gene Ther. March 2016, ahead of print. doi:10.1089/hum.2015.172. PubMed PMID: 26854857 . Human Gene Therapy . The FusX system consists of pre-assembled trimers where 14.5 to 16.5 repeats of the TALE domain can be assembled in a single Golden Gate reaction, which streamlines assembly into a single-tube 3 day process. The FusX kit is backward compatible with all TAL effector scaffolds previously constructed for the Golden Gate TALEN and TAL Effector Kit 2.0 . The FusX assembly system is designed to support high throughput robotic liquid handling in order to minimize the human error factor and enhance scalability. Figure 1 from Ma et al. Hum Gene Ther. March 2016, ahead of print. PubMed PMID: 26854857 . 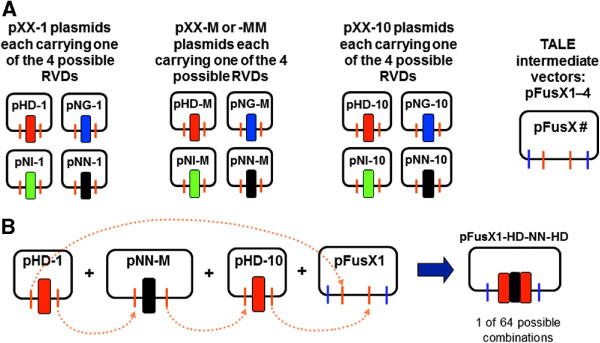 "The complete pFusX collection for Golden Gate assembly of 15-RVD TALENs was a gift from Stephen Ekker (Addgene kit # 1000000063)"
FusX: A Rapid One-Step Transcription Activator-Like Effector Assembly System for Genome Science. Ma AC, McNulty MS, Poshusta TL, Campbell JM, Martínez-Gálvez G, Argue DP, Lee HB, Urban MD, Bullard CE, Blackburn PR, Man TK, Clark KJ, Ekker SC. Hum Gene Ther. March 2016, ahead of print. doi:10.1089/hum.2015.172. PubMed PMID: 26854857 .